It blows my mind that Paseo Grill has only been open for 12 years. Not that anything in the building seems old or worn out; I just can’t imagine the Paseo Arts District without it. The restaurant is a fascinating paradox. Step inside and you’ll see old friends meeting for lunch, a romantic rendezvous, a business meeting over drinks and everything in between. It’s not a place where you’re required to dress up, but it definitely makes one want to look nice. Paseo Grill is comfort fancy. And that extends to the food, as well. Portion sizes are spot on. You might have some leftovers if you order too much, but generally you’ll finish what’s on your plate and leave sated. I know lots of us enjoy giant portions, but it’s also nice to eat somewhere where you’ll leave happy with how tasty everything was and not miserable because you ate so much your belt is not cutting off the circulation to your legs. Yes, I am speaking from experience. 2. Order like there are three of you. 4. Dessert? Oh, well, I shouldn’t, but let’s just look at the menu. Before we get to the food, let me make one more recommendation: get a reservation. And if you want one of those nice curtained tables, the ones where you get a little extra privacy and romance, ask. Some dishes remain on the Paseo Grill menu ever after more than a decade in business. That’s a pretty good sign you’ve got a classic on your hands. While they’re certainly not afraid of keeping beloved items around, the restaurant is always working on new specials and seasonal meals. 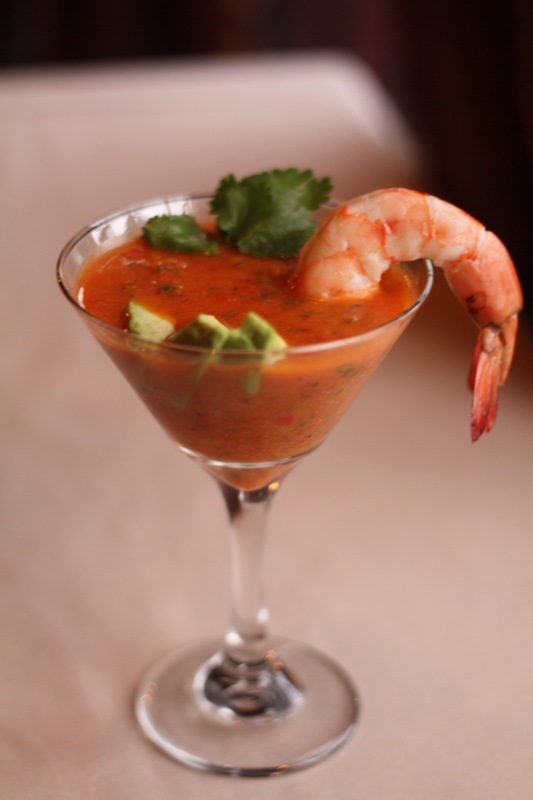 If you go this summer, I highly recommend the gazpacho ($7) with an added shrimp ($3). Gazpacho is what happens when somebody says, “What if you could drink salsa?” It’s a chilled, slightly chunky fresh tomato soup with lots of cucumber and red bell pepper and garlic and garden-y goodness that finds that sweet spot between big flavors and small form factor. You can fill up on gazpacho, but it takes a lot of work. Paseo Grill’s version includes some lovely slices of ripe avocado, which adds a creaminess and a little balance to the tomato’s acidity. There’s also some poblano chile flavor, but none of the heat, which is a nice trick. All in all, I think it’s one of the best gazpachos I’ve had in quite a while. The shrimp isn’t mandatory, but man, it’s good. The restaurant uses U-12 shrimp, which are enormous. In shrimp, much like in golf, a smaller number is preferred. U-12 shrimp mean there are less than a dozen shrimp in a pound. They big. If you got three of them and stuck them between your fingers, they’d look like a delicious version of Wolverine’s claws. SNIKT! This shrimp was cooked perfectly. Just the right amount of snap without any rubberiness from spending too much time in the boil. This is a specialty of Paseo Grill. 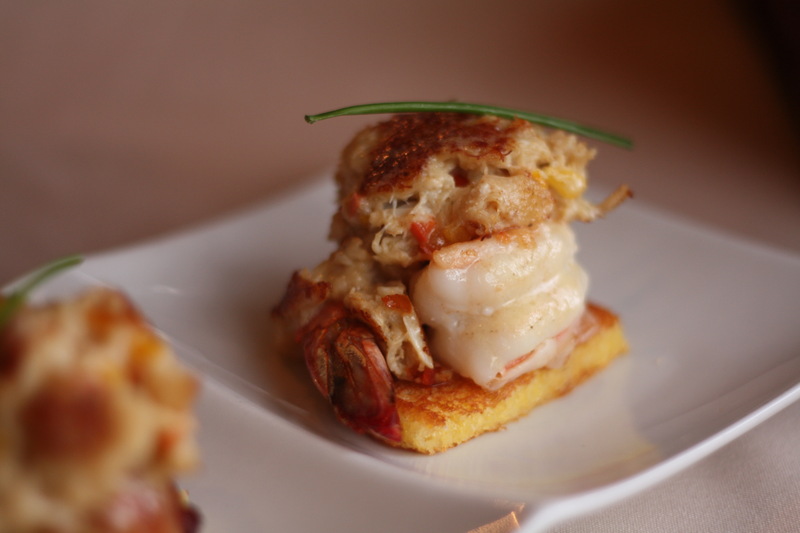 These folks know how to cook shrimp, as I found when I tried the shrimp and crab johnny cake appetizer ($6) alongside the scallop and crab johnny cake appetizer ($9). Johnny cakes are thin, corny pancakes, and they add a mild, hearty sweetness to each bite. 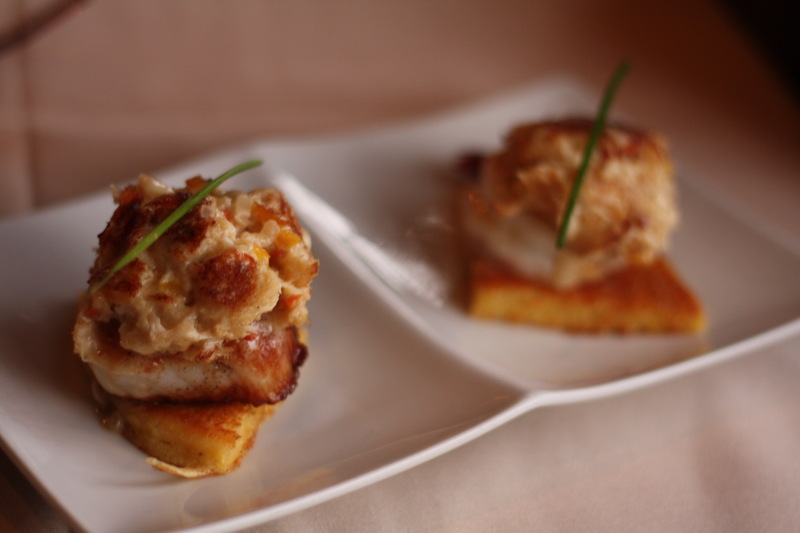 Each one is topped with either a U-12 shrimp or a diver scallop, which is then stacked with lump crab and drizzled in beurre blanc (aka white butter sauce). 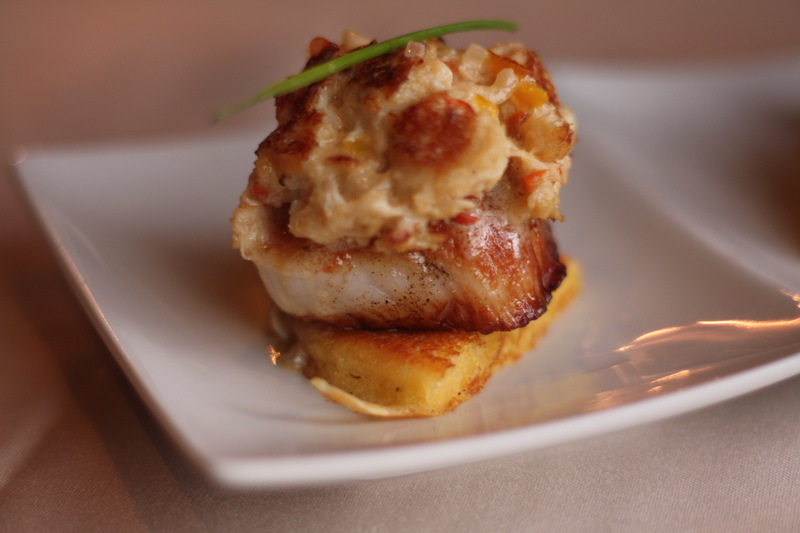 The scallop is buttery and smooth, but it’s a mild flavor that lets the sweetness of the corn and crab to come through strongly. The shrimp is a bit more briny, more assertive, but it’s gorgeously seared and has more texture, too. I absolutely gobbled these down like a monster and I’d do it again in a heartbeat. My pal Elise told me they can even fashion it into an entree of sorts for those who request it and, you know, I endorse that decision unreservedly. 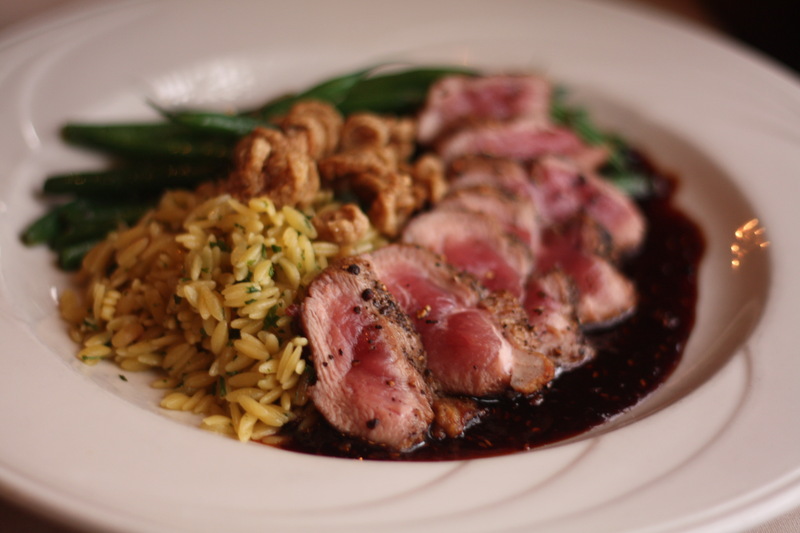 But, if you’re looking for something a tad more filling, might I recommend the duck breast over a raspberry bourbon sauce ($27)? Of course I might. I just did and there’s nothing you can do to stop me! It’s too late! The cat’s out of the bag and I wish you’d stop putting him in there to begin with! It doesn’t matter how many cops you send it, they can’t stop me from telling everyone about sauteed duck breast from Maple Leaf Farms. You can get it medium rare or medium (or more done, if you’re crazy). It’s such a lovely flavor. Duck is often accused of being “gamey,” but this is nothing of the sort. It’s a singular taste and I think you ought to try it both with and without the sauce to really get to know what good duck is like. The raspberry bourbon sauce is rich and darkly fruity — it’s a nice sweetness that plays off the richness of the duck without becoming saccharine. You’ll see some crisp, almost Cheerio-looking garnish on top. Those are slivers of the duck skin that have been deep fried. Oh, yes. Try one on its own and then pair it with a piece of the meat. On the side you get sauteed green beans, tender but with a nice snap, and a toasted pine nut orzo that adds more subtle flavors to each bite. This is the kind of mix-and-match plate that I love. Every element is great on its own, but as you test each one in concert with another, you really develop an appreciation for the thought and care that went into its creation. If you think you’re done, haha, no you’re not. Paseo Grill’s desserts are not something you’re allowed to miss. I got the crème brûlée ($8) and I’m happy to report it was an excellent decision. 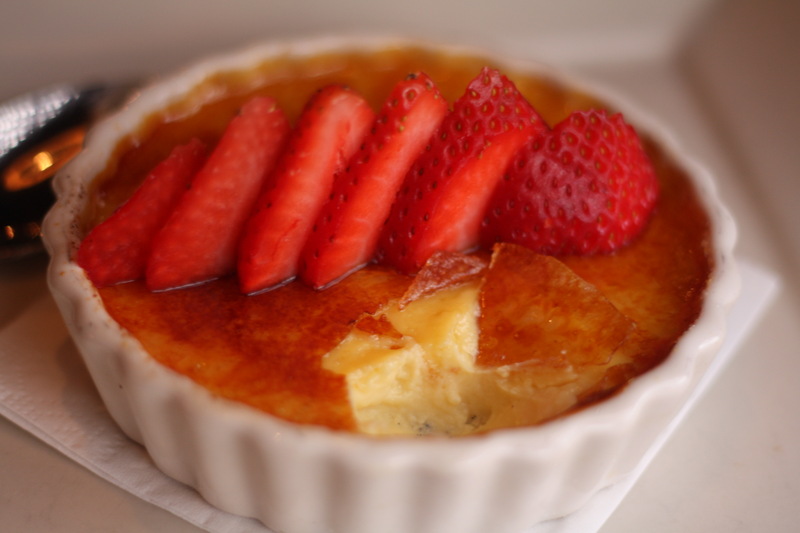 Crème brûlée has long been one of my most-favorite indulgences, and considering my entire job is about indulging myself, I hope you understand the weight of that statement. It’s not always the easiest dish to serve, however. It requires skill and precision, lest you end up with a runny custard or, worse, a dish of sweet scrambled eggs. The vanilla custard here is set perfectly, lightly quivering in anticipation of your spoon. On top you get a perfect shell of caramelized sugar to crack open. Scoop up some crunchy sugar, custard and a slice of tart strawberry and take your taste buds for a ride. Paseo Grill might seem like a place of effortless class, but I know for a fact there’s a ton of effort going on behind the scenes to make everything feel stress-free and spectacular for diners. That attention to detail is why the restaurant feels timeless and timely all at once.